With milder class I and II rapids, the Tuckaseegee River is ideal for rafters of all ages. This quaint whistle-stop town is only two blocks long. Tree House Pottery offers an array of local and regional pottery. The Tuckaseegee River brims with brown, brook, and rainbow trout. Small but mighty is an apt descriptor for Dillsboro. 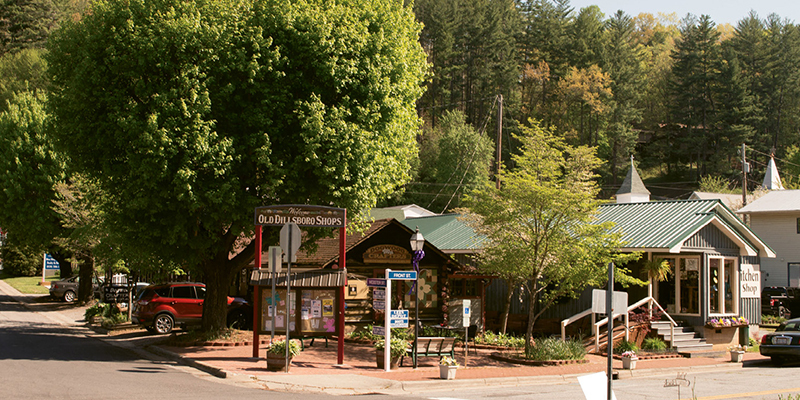 Located less than three miles from the Jackson County seat of Sylva, the tiny town packs a vast array of arts, crafts, and opportunities for adventure into a mere .4 square miles. Just two blocks long, Dillsboro proper is easily walkable. An ideal place to begin a visit is Dogwood Crafters. In operation since 1976, it’s one of the oldest continuous craft cooperatives in America. The gallery features an impressive variety of contemporary and traditional arts and crafts, all made by artisans that live within 100 miles. Another must-see art attraction is Toad in the Hole. The cozy space offers fiber art, tapestries, pillows, jewelry, global home accessories, and gifts, as well as mixed-media and copper art. Browse the functional and artistic pottery, including vases, pots, and platters, inside the bright and airy Tree House Pottery, where you can often watch one of the owners crafting pieces on the spot. With an espresso bar and award-winning chocolates, including fudge, truffles, and ganache liquors, the Dillsboro Chocolate Factory is not to be missed. Its meat jerkies, which include both beef and wild game such as buffalo and elk, make a savory counterpart to irresistible sweet treats. This year marks its 20th in operation; to celebrate, look for 20 percent off a selected item per month, including jerky in July and jelly beans in August. For outdoor adventures, head to Dillsboro River Company for kayaking, rafting, and tubing. During summertime, food trucks are frequently on-site and there are plans to bring in a beer truck so people can purchase and enjoy a cold brew before launching into the Tuckaseegee River. Take advantage of one of the most well-stocked trout rivers in the state with the Tuckaseegee Fly Shop, which offers gear sales and rentals, as well as guided instruction. Seeking an educational experience? The new Appalachian Women’s Museum, located inside the historic Monteith Farmstead, is an inspiring tribute to Southern Appalachian women and their varied contributions to their culture and communities, while the curious American Museum of the House Cat is just a scamper away. In addition to its more than 30 years of feline art and artifacts, the museum educates the public about the care and welfare of shelter cats. Haywood Smokehouse is a meat-lover’s paradise. This comfortable, casual spot offers Texas-style barbecue, including brisket that is slow-smoked for upward of 20 hours. Classic Southern sides like collard greens and macaroni and cheese share the same deep, slow-cooked flavor. The Well House is named after Dillsboro’s first well, parts of which are visible in and around the eatery. Its salads are enormous in both size and flavor. Before you head out of town, check out the Jackson County Green Energy Park. Perched atop an old landfill, this art studio and gallery utilizes methane from the landfill in its operations, making it one of the only art studios in the world that is powered by renewable energy. Watch glassblowing and blacksmithing demonstrations and enjoy the gallery. The beauty of the region, paired with such innovative ways to protect it, leaves a lingering sense of awe and appreciation. Historic Dillsboro - See www.visitdillsboro.org to learn more.